The state rail company VR has said that it will substitute buses on some of the cancelled rail trips. State-owned rail services provider VR has announced that it will suspend some inter-city train rides until Thursday due to heavy snowfall and freezing temperatures. Last weekend, VR had said that snow would cause delays and cancellations into Monday. VR said however that 95 percent of its services would remain operational. The decision means no rail services on 18 routes, some of which will be served by buses instead. The suspended routes include trips between Helsinki and Turku, Helsinki and Tampere, Helsinki – Lappeenranta, Tampere – Vaasa and Vaasa and Seinäjoki. Commuters are being advised to check the VR website for a full list of the affected routes. The company said that recent unusually heavy snowfall has affected rail switches and also disrupted trains’ electrical and air pressure systems. In addition snow and ice have also damaged some of the firm’s rolling stock. VR said it hopes that cancelling some services will allow time for thawing and maintenance of the trains. VR has also advised commuters to prepare for delays on other routes that remain operational. The Finnish Transport Infrastructure Agency (Väylävirasto) said that Finland’s railways are prepared for snow. "We are now running rail maintenance at maximum volume and we are prepared for expected snow. 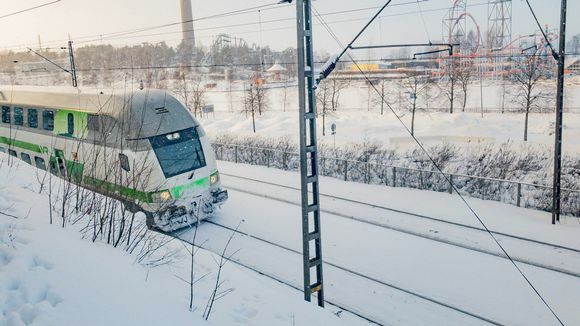 But since the beginning of the year we have already experienced five sets of thick, long-lasting snowfall in southern Finland," maintenance unit director Magnus Nygård said in a statement. Daily Helsingin Sanomat reported on Monday Helsinki had seen historic levels of snowfall this winter. Edit: Updated at 6.42pm on 5 February to reflect that some, not all VR services would be suspended and to include VR's comment that 95 percent of rail services would remain operational.